Before walking down the aisle, exchanging vows, cutting the cake and dancing the night away with your friends and family, a bride and groom have many stresses to deal with before their big day. Teeth whitening is not on Visalia residents’ minds, especially with Decorations, caterers, music, venues, and last minute cancellations to think of. The last thing you want to worry about while your photographer is snapping away is your not-so-white smile! Bright, beautiful smiles are universally treasured by brides and grooms alike, and there are many treatments available to satisfy every budget, time frame, and personality. 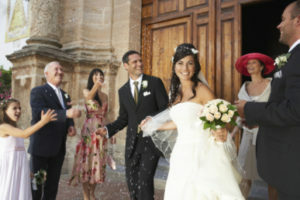 Members of the wedding party can choose from gel to light-accelerated bleaching. With an already packed schedule of fittings and cake testing, a quick whitening session will easily fit right in! Practically everyone who selects this cosmetic treatment will see moderate to substantial improvement in their smile. Whiter teeth can really brighten up your face and make you look fresher, healthier, and younger. And who doesn’t want that? The photos of your wedding day will be cherished forever. Every bride wants to look back on that day as the day she felt her most gorgeous! Don’t let dull, yellowing teeth keep you from saying ‘I do’ with your biggest smile. Then, at the end of the night when the cake is eaten, the wine is drunk, and all the guests leave, you’ll be left with beautiful memories and a beautiful smile. We would love to be a part of this most memorable occasion. If you are in Visalia and believe Visalia. Endodontics will benefit you, please contact us and make an appointment.